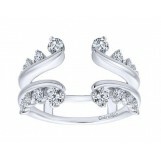 This Diamond Ring Guard is designed by New York Fashion Jewelry Designers, Gabriel & Co. The Ring Guard is crafted in 14k White Gold and features Round Brilliant Diamonds totaling 0.81 carats, that are G-H in color and SI clarity. Are you ready for an anniversary band that will take your engagement ring to the next level? 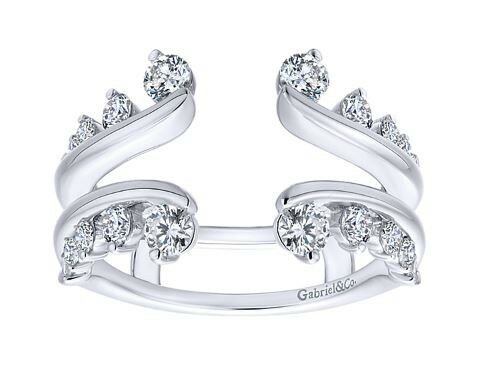 The Ring Guard is the perfect addition to any solitaire diamond ring. Ring Guards are also known as Ring Jackets, Enhancers and Wraps, and propose a perfect solution for a bride looking to upgrade her wedding rings. Ring Guards are typically purchased as a wedding anniversary gift for a bride who has enjoyed wearing her solitaire Wedding Ring Enhancers, and Choose to wear your ring guard all of the time, or just on special occasions, the choice is yours! The ring guard essentially replaces the need to wear your wedding band and enhances the solitaire engagement ring to create a unique diamond engagement ring. 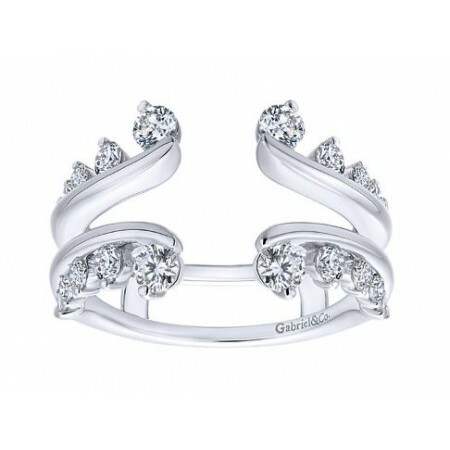 A ring guard is both practical and functional as it offers the ultimate freedom in choosing when and where to dress up your solitaire engagement ring.